Most of the time I serve my cakes with coffee, I don’t necessarily put coffee into the cakes. Coffee can be a difficult flavor to work with when it comes to dessert because it can be fairly aggressive with the other flavors. 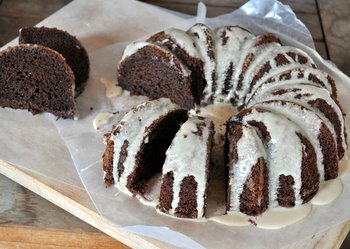 When I was putting together this Mocha Bundt Cake, however, I was set on creating a coffee cake that actually tastes like coffee. My solution was to use chocolate to balance the coffee flavor and give it a nice, rich base to sit on. I used a lot of instant espresso powder (as well as some strong, brewed coffee) to infuse the cake with coffee. In the end, it turned out to be exactly the cake I had in mind: moist, intense and with a great coffee flavor. Get the recipe at Baking Bites.